One of the best ways to separate the principled limited government conservatives in Congress from the establishment Republicans in Congress is to check the record and see who has been rocking the boat; and who has voted against the big spending/big government House leadership is a good measure of “rocking the boat” on Capitol Hill. That is why we were completely amazed to read in The Wall Street Journal this quote from Tea Party backed Congressman Ted Yoho (FL-3): "They're overlooking what we're here for," Yoho said in criticism of conservative opposition to the Farm Bill. "We're here to legislate." 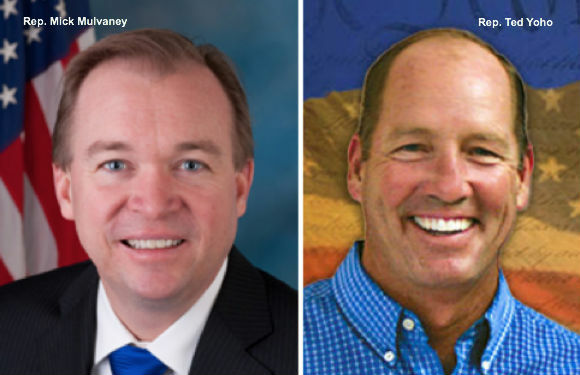 Likewise, South Carolina’s Mick Mulvaney, whom we regularly laud on this site for his principled stands for liberty and against big government, was quoted by the WSJ as complaining that Heritage Action and other conservative organizations had opposed the Farm Bill strategy he and some other House conservatives pursued: "We went into battle thinking they [Heritage Action] were on our side, and we find out they're shooting at us," said Mulvaney. We would expect these kinds of complaints from House Ag Committee Chairman Frank Lucas of Oklahoma, who is good on many social issues, but rarely meets a federal farm or agriculture industry program he doesn’t like. But to hear complaints about conservative opposition to big government from two among the regular House “boat rockers,” what gives? We are not going to get down in the weeds of the differences of opinion among conservatives over the details of the Farm Bill and the two bill versus one bill strategy other than to say that the $20 billion in alleged “cuts” over ten years is a drop in the bucket in programs that have grown explosively during the Obama presidency. Too many otherwise conservative individuals get elected to Congress and soon come to believe that they are “leaders” entitled to uncritical support, instead of “representatives” translating the wishes of “We the People” into policy and action. And they get annoyed when “We the People” question their policy decisions or demand real action instead of words. We support Heritage Action, The Club for Growth and other conservative organizations that are at the forefront of using the technology of the new media to translate the wishes of “We the People” into political and policy action. Even when that means holding our friends’ feet to the fire. Holding our friends’ feet to the fire is something that we do, and we think conservatives must do – regularly if required – to keep our representatives focused on what we think is their most important job; representing “We the People” and managing the government according to limited government constitutional conservative principles. Submitted by jwagner on Tue, 07/30/2013 - 16:39. I don't care what anyone else says, I have a gut feeling that Sarah is exactly what we need to return our country to Constitutional principles and law. Not that Sarah is not intelligent, but we don't need a Rhodes Scholar or Harvard scholar for president. We need someone with integrity, guts, and honesty -- and that's Sarah. Submitted by rtoberl on Wed, 07/31/2013 - 12:19. Palin/West 2016! Will defeat any sexist/racist labels that will be attached to any other combo. Submitted by neal.hightower1 on Tue, 07/30/2013 - 10:39. With the exception of Paul, Cruz, Lee and a handful of others, they all need to be watched very carefully.